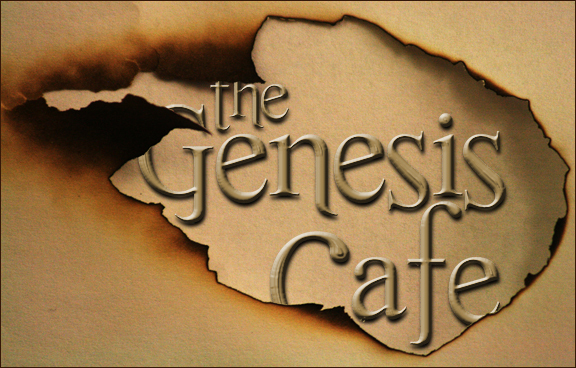 Book Release: The Genesis Cafe! The day that every writer looks forward to with mingled emotions of excitement, trepidation, anticipation and that wonderful sense of accomplishment. The Genesis Café: Conversations on the Kingdom is hereby officially released! I've wanted to write a book about the Kingdom of God since around 2008, and at numerous times, started to pull things together towards that end. But it always seemed, somehow, that the timing or the approach just wasn't right (for whatever reason). In the opening chapter, I enlisted the assistance of the Younger and the Elder in helping me explore the question of what Jesus meant when He said, "The Kingdom is near, repent and believe the good news". Let me tell you, it is a lot of creative fun to write scenes in a pub where you (as the author) and two characters you've created are all having a three-way conversation! Writing a narrative story about understanding the Kingdom of God was a challenging approach, and entailed a great deal of good, old-fashioned hard work. And I really, really enjoyed the whole creative process. This was a fun book to write! I'm passionate about the topic, I'm thrilled with how the book turned out, and I'm excited to announce that The Genesis Café is now available. 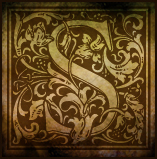 The Kingdom of God was often presented with metaphors, parables, and symbols. The Pearl of Great Price, the Parable of the Sower, the Treasure Hidden in a Field, to name just a few. 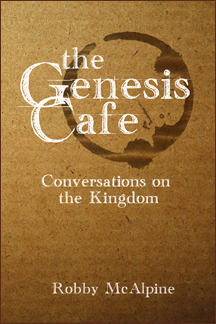 In keeping with that motif, the cover artwork for the about-to-be-released The Genesis Cafe: Conversations on the Kingdom is chock-full of symbolic elements that find their way prominently into the storyline. See how many you can correctly identify! In writer's terms, this is called foreshadowing. Or perhaps it's a little too blunt-edged to be truly foreshadowing. I suspect foreshadowing is actually supposed to be a little more subtle. Mysterious, even. Anyway, the bottom line is: very soon. 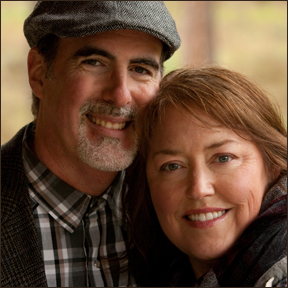 Our youngest daughter, Renee, was of the opinion until just a few weeks ago, that Wendy & I had chosen the 4th of May as our wedding date because of Star Wars. And today, that dashingly attractive couple in the picture above now celebrates 28 years of marriage. Wendy is absolutely incredible (and gifted), and I love living life with her. 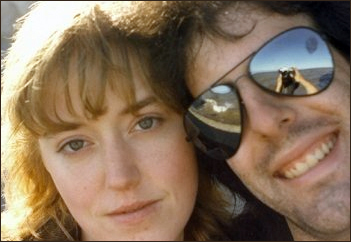 And it is kinda fun to be able to say "happy anniversary" and "May the Fourth be with you". And now, off to fulfill my daily morning ritual of bringing my wife a steaming cup o' coffee in bed. When the Israelites first entered the promised land after 40 years in the wilderness, after crossing the Jordan River in much the same manner as when Moses had parted the Red Sea, Joshua instructed them to set up stones of remembrance to serve as a memorial (Joshua 4:4-7). The recurring theme was simply "when your children ask 'what do these stones mean'....", you had another opportunity to re-tell a part of your story as God's people. In the early part of the 21st century, it's equally important for us, as well, to stop and remind ourselves of some of our own personal stones of remembrance. I was raised in a Christian family, but the night of my surrender to Jesus was an evening of shock and surprise. Mainly because I didn't go to the evangelistic meeting with an open mind; I only went to placate some of my earnest Christian friends. 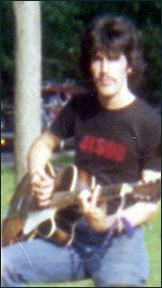 God had other things in mind, despite my contempt for the 'band' and my ignoring of the spoken message. "Surrender" is perhaps the best only word that adequately describes my response to God's wake-up call to me. The Holy Spirit is alive. And well. And shows up sometimes when nobody was even expecting Him. I was camp staff at our denominational camp that summer, and during a prayer time with a bunch of other 15-17 year-olds, the Holy Spirit 'showed up' in an experience of God's love that everyone in the room was blown away by. Doubly miraculous was that our camp/denomination was legendary for it's staunch anti-charismatic bent. Satan is not just a marketing tool for cheezy 1980s hair metal bands. But Jesus is more powerful. An unexpected spiritual attack - completely with visions of satanic imagery - came out of nowhere (as far as I could tell, anyway) and scared the liver out of me. But it turned out to be true what they say: in the name of Jesus, we have authority over evil spirits. Good news for those of us being attacked. Spiritual leaders who are controlling, manipulative, and abusive are a royal pain in the patookus. I learned this the hard way at the same summer camp; while not without my own issues, the harsh words of constant judgement and condemnation were total overkill. Almost cult-like, you might say. On the plus side, this was the first of many times where I began to learn how to sift through religious crap trappings to find the Pearl of Great Price. And as I look back over the ensuing span of years, I find (perhaps not surprisingly) that all of the above are as true today as they were when I was sixteen. If anything, I am more aware of the reality (and some of the implications) of each of those early Stones of Remembrance. What Stones of Remembrance can you think of in your own spiritual journey?